Video communication offers significant benefits for improving group collaboration and breaking distance barriers. 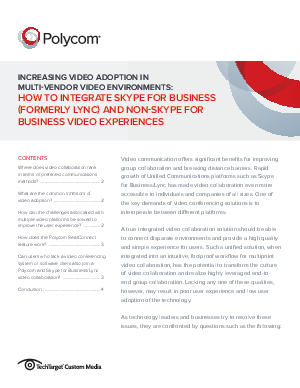 Rapid growth of Unified Communications platforms such as Microsoft Skype for Business has made video collaboration even more accessible to individuals and companies of all sizes. One of the biggest challenges in video conferencing is to provide a high quality and simple user experience. This, combined with an intuitive, foolproof workflow familiar with users can result in a highly leveraged end-to-end group collaboration solution. This FAQ addresses common inhibitors of video adoption, improving the user experience in multi-video environments, the inclusion of non-video users, and more.